Back Room | Fine China & Porcelains; Glass & Art Glass; Art Pottery; Silver; Estate Fine & Vintage Costume Jewelry; Furs; Clothing; Linens; Collectibles; Coins/Currency; Books; Ephemera; Toys; Discovery Table & Box Lots, and much more. Front Room | Antique & Quality Reproduction Furniture; Decorative Arts; Fine Art; Country Antiques & Primitives; Clocks; Carpets; Tools (at 1PM); Electronics; Miscellaneous Home Items, and more. 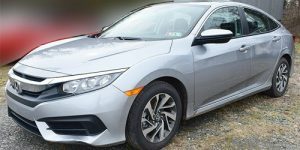 8PM: ESTATE AUTO | 2018 Honda Civic 2.0L EX with only 1,730 miles! To Be Sold At Absolute Auction.